The blue pitta (Hydrornis cyaneus) belongs to the family of pittas, Pittidae. 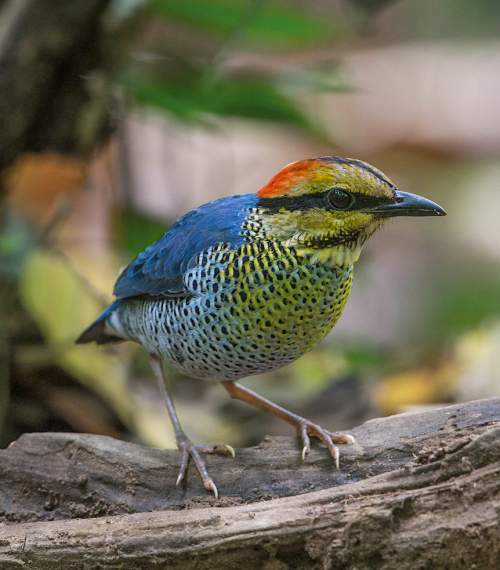 The blue pitta species are distributed in India, Bangladesh, China, Myanmar, Thailand, Vietnam, Laos and Cambodia. These pitta species are terrestrial birds of wet forest floors. These pittas are polytypic species. The blue pitta (Hydrornis cyaneus) is a medium-sized pitta, measuring 20 to 25 cm in length and weighing 100 to 120 grams. The upperparts and tail of male blue pitta are bluish. In the female the upperparts are bluish gray and the rest of the plumage is duller than the male. The male bird has a conspicuous flame-orange hindcrown and nape. The cheeks, forehead and front crown are yellowish. There is a central black stripe on the crown. There is also a black stripe passing through the eye. There is a black patch in the yellowish chin. There is a yellow front necklace of smooth feathers. The breast is pale yellow and rest of the underparts are pale blue. The breast, belly and flanks have black speckles and bars. The tail is short and the undertail is black. The bill is bluish gray. The irises are dark brown. The feet are pinkish gray. The blue pitta call is a a soft “pleoo-iit” or “choocoo-ip” sound. The blue pitta species are distributed in India, Bangladesh, China, Myanmar, Thailand, Vietnam, Laos and Cambodia. In India, these pitta species are distributed in Assam, Meghalaya, Arunachal Pradesh, Nagaland, Manipur, Tripura and Mizoram. In China, they occur in southwest Yunnan province. 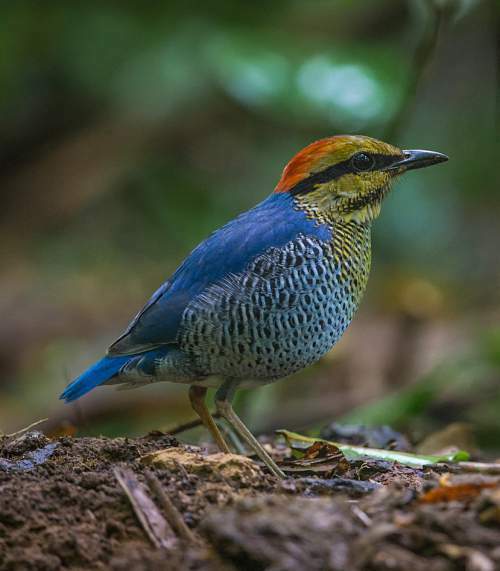 The blue pitta nominate subspecies H. c. cyaneus is distributed in northeast India, east Bangladesh, Myanmar, south China (Yunnan), south Thailand, Kra Isthmus region, north Laos and vietnam. 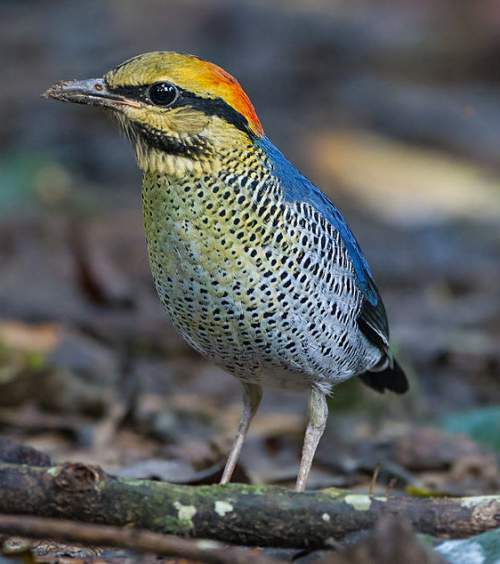 The blue pitta subspecies H. c. aurantiacus is distributed in southeast Thailand and southwest Cambodia. The subspecies H. c. willoughbyi is distributed in central Laos and central Vietnam. The Important Bird and Biodiversity Areas (IBA) of blue pitta species in Laos are, Upper Xe Kaman, Dong Ampham, Nam Ha, Eastern Bolikhamxay Mountains, Nakai-Nam Theun and Nakai Plateau. The IBA in Cambodia are Phnom Bokor and Phnom Aural. These blue pitta species have high forest dependence. These species normally occur in altitudes from 60 to 2000 meters. The natural ecosystems of these bird species include tropical and subtropical moist lowland forests, evergreen forests, tropical and subtropical dry forests, bamboo forests and tropical and subtropical moist montane forests. The diet of the blue pitta consists mainly of invertebrates. A variety of insects, insect larvae, grasshoppers, mantises, worms, grubs, snails and beetles are their primary food. They forage on the forest floor, picking up prey from the floor litter as well as probbing and digging up soft soil for worms and other invertebrate prey. The breeding season of the blue pitta species is from May to July in India and Myanmar. The laying season is from June to October in Thailand. These blue pittas are monogamous and are strongly territorial. They perform territory defence displays and make territorial calls. Both of the pairs take part in building the nest. The nesting sites include forest floor and tree branches. The nest is a large dome-shaped spherical structure with side entrance. The nest is a loose structure built with twigs and forest floor debris and is well camouflaged amongst vegetation. The clutch usually contains 3-6 eggs. Both parents incubate the eggs. The chicks hatch out in about 14-16 days. Both parents participate in rearing the chicks. The hatchlings are entirely altricial, relatively immobile, blind and nacked. The blue pitta species are non-migratory resident birds. Birds in higher elevations may make some local altitudinal movements, descending to lower levels and plains in winter. The global population size of the blue pitta (Hydrornis cyaneus) has not been quantified. The overall population trend of these species is not known. Throughout its range this pitta species is reported to be locally abundant to very rare. The generation length is 4.2 years. Its distribution size is about 2,380,000 sq.km. Deforestation, habitat degradation and fragmentation and capture of adults and juveniles for pet trade are the main threats that may endanger the survival of these pitta species. The blue pitta (Hydrornis cyaneus) does not approach the thresholds for being Vulnerable, either under the range size criterion, or under the population trend criterion or under the population size criterion. The IUCN (International Union for Conservation of Nature) has categorized and evaluated the pitta species and has listed it as of "Least Concern". The CITES (Convention on International Trade in Endangered Species of Wild Fauna and Flora) status is ‘Not Evaluated’ for blue pitta (Hydrornis cyaneus). The blue pitta (Hydrornis cyaneus) is closely related to the Schneider's pitta (Hydrornis schneideri) and the giant pitta (Hydrornis caeruleus). The three recognized subspecies of blue pitta are: Hydrornis cyaneus cyaneus (Blyth, 1843), Hydrornis cyaneus aurantiacus (Delacour & Jabouille, 1928) and Hydrornis cyaneus willoughbyi (Delacour, 1926). Current topic in Birds of India: Blue pitta - Hydrornis cyaneus.